Regionally, our snowpack was put under tremendous stress with the rain on snow event centered around Friday- Saturday. The amount of precipitation accumulation varied from 3 inches in the Purcells to over 5 inches in the West Cabinet Range. This massive storm was preceeded and followed temperatures in the 35-40 degree F range. Snowpack depletion was significant below 5,000 feet, and snowpack drainage was significant below 6,000 feet. 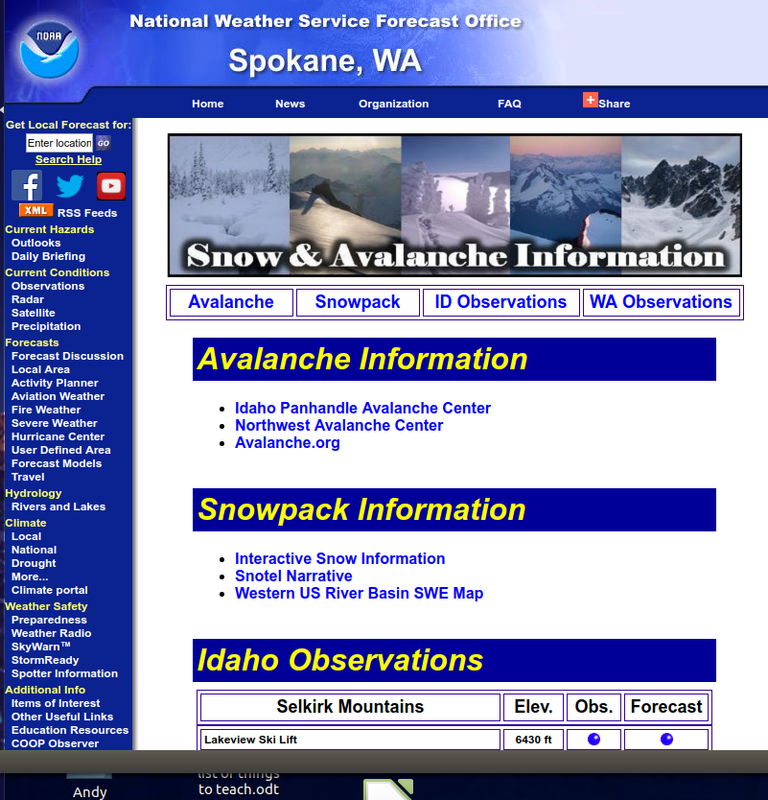 Our current snow pack is dominated by loose wet avalanche conditions to 6,000 feeet elevation. Backcountry travel under these snowpack conditions is arduous due to ski/boot penetration. Travelers are advised to wait for colder weather when snow surfaces will be stronger. Unusually high amounts of free water were entrained in our snowpack below 6,000 feet during the Friday-Saturday rain on snow event. 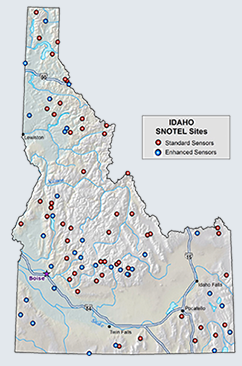 Significant snowpack drainage was reported at many SNOTEL sites. Where snowpacks covered bedrock or smooth convex slopes, glide cracks have developed or advanced. These are normally easily identified and travel below them should be avoided. When glide cracks give in to gravity, releases to the ground are common and the snow/debris moved can be significant. Current hazard hinges on the weather. Risk will diminish if we get seasonally normal temperatures. The snowpack is nearly isothermal, hovering just below freezing. It contains a fair amount of free water in its loose wet state. Since we lost a lot of our snowpack during the rain on snow event, upper elevations above 6,000 feet will be our focus in the near future. As we move into a drier but still unseasonably warm weather pattern on Wednesday, backcounrty travelers will still need to be paying attention to the loose wet snowpack. Travel is advised when temperatures are colder, or move to shaded/colder slopes as the day progresses. The mountains are noisy with the sound of running water everywhere. Streams are running full bank. We were apprehensive over the weekend with the huge rain on snow event. Today in viewing the aftermath of this storm, we were surprised. Below 5,000 feet the rain nearly eliminated the snowpack. Below 6,000 feet we found some evidence of wet slab releases, but not the magnitude we expected. Below 7,000 feet we saw evidence of loose wet releases that ran in sheets. When I departed yesterday morning, I made sure my camera was fully charged. I was going to take multiple photos of wet slab debris fields filled with trees, rocks, soil and snow. In summary, I do not think our below normal snowpack could have supported that level of activity! I got some good photos, they are sprinkled throughout this advisory. Yesterday, I visited the south aspect of Shaw Mountain elevation 6,468 feet in the East Cabinet Range. At 5,500 feet elevation, I found 39 inches of snowpack that was nearly isothermal. Ski penetration was 4-6 inches and boot penetration was 16-18 inches. I was able to hike on bare ground a considerable distance to reach 5,500 feet. The snow pack was dominated by loose wet condtions. Remnants of our significant ice layers (ex. Thanksgiving) were present but had softened. Extended Column Tests yielded no definitive results. Snowpack conditions will improve dramatically with more normal daily temperature fluctuations. Since the Saturday February 7th HIGH advisory, weather in the Kootenai Region has been warm and wet. All SNOTEL sites are reporting temperatures above 35º F since Saturday morning. SWE increases since Saturday are all across the spectrum: Banfield Mtn +0.2 inches, Bear Mtn +1.1 inches, Hawkins Lake +1.2 inches, and Poorman Cr drain -0.8 inches. Precipitation totals for the Friday-Sunday period range from 3 - 5 inches. Yesterday's weather in upper Libby Creek near Shaw Mountian of the East Cabinet Range was mostly cloudy with locally heavy rains, calm winds and 36º F. Forecasted weather is mostly cloudy through Tuesday afternoon then partial clearing by Wednesday with temperatures above freezing with highs near 40º F, 70-100% chance of rain Tuesday then drying Wednesday, 4-9 inches of snow above 5,000 feet with rain below that elevation.